Look at his stern and stiff denial, dated a month ago, calling me a liar who invents stuff. 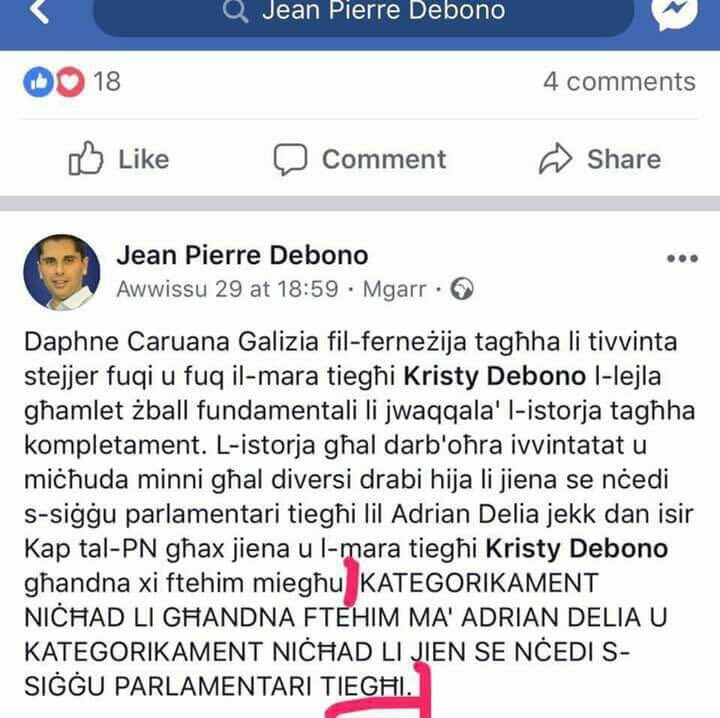 And a month later, they’re wreathing him in praise and garlanding him with laurel because…he’s giving up his seat for Adrian Delia. I have no doubt there was an agreement back then. Just as I have no doubt that the agreement fell through or terms sufficiently beneficial failed to be agreed upon. And when Delia’s cronies were still casting about in desperation for a casually-elected candidate to give up his or her seat days after he was elected leader, that doubt was confirmed. And then they leaked the Nationalist Party’s electoral commission report to a newspaper and did him in. What a waste of space. The Nationalist Party is jam-packed with two-bit schemers who couldn’t plot their way of a paper-bag because they don’t have the brains, and belly-crawling goons and opportunists. And we are supposed to admire and respect these rank eejits and give them our vote so that they can dig their ugly snouts even deeper into the trough. No wonder they hang about with each other. The thought of being confined to a dinner-table with any one of these sub-educated inhabitants of the boondocks who are totally backward and can’t make any kind of conversation except their own backwoods chit-chat is enough to make any civilised person feel queasy. Qabda nies minn ta’ wara l-muntanji: the curse of Malta, because they’re the precise type who are forever gagging for il-power as the be-all and end-all in their otherwise miserable and meaningless boondocks lives.